You may have heard of FROWNIES before. They are known for their facial “tapes” to fight wrinkles. Now, they have a power-packed serum thats effective and affordable. Introducing FROWNIES’ IMMUNE SHIELD. It’s specially formulated with a plethora of fine oils for inflammation and dry skin. Their advanced formula Vitamin E serum protects and repairs your skin. It glides on nice and smooth on. your face and has a pleasant scent. Most importantly are the main ingredients like Hemp Seed Oil. Their Whole Oat Oil E has both moisturizing and sunscreen benefits, naturally occurring antioxidants, essential fatty acids and properties such as phospholipids and tocopherols and amino acids. The Vitamin E ingredient protects against oxidation. The other main ingredients? How about Daikon Radish Seed Oil to leave your skin feeling soft and smooth? In addition, there’s Sea Buckthorn Oil that features the highest food source of Vitamin C, E and Beta-carotene. Meadowform Seed Oil is also spotlighted, which is a superior anti-oxidant that helps prevent dryness. Plus, Olive Squalene contributes to regenerate and replenish the natural levels of squalene lost through the aging process. It promotes resistance to inflammation, too. Carrot Seed Oil is included in FROWNIES IMMUNE SHIELD with one of the highest sources of pre-cursor Vitamin A, known for its ability to rejuvenate a lackluster complexion. I like the fact that it is beneficial for all skin types. It’s useful for someone with sensitive skin or like for me, an anti-agains regimen, Even users blessed with normal skin will benefit from the ingredients in IMMUNE SHEILD. Apply liberally before and after you go out in the sun to protect your skin from that awful UV ray damage. So how can you use this product? In many ways! For your body, try IMMUNE SHIELD daily on your body to soothe your skin, even after a sunburn. On your face, use it on fine lines, wrinkles and dry skin. Pat a small amount under your eyes and eye lid area and your lips to keep them smooth. You can even use it on Rosacea, and again, any type of inflammation. Moreover, it’s great for stretch marks, scars and acne. 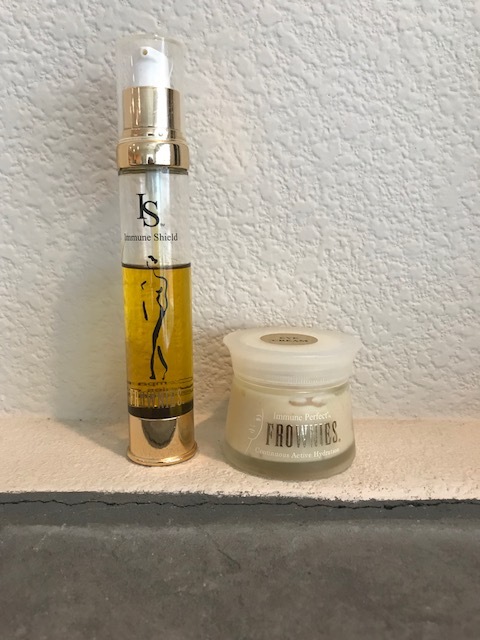 Made in the USA, protect and repair your skin with FROWNIES IMMUNE SHIELD. For details visit Frownies.com or call (800) 648-6891.